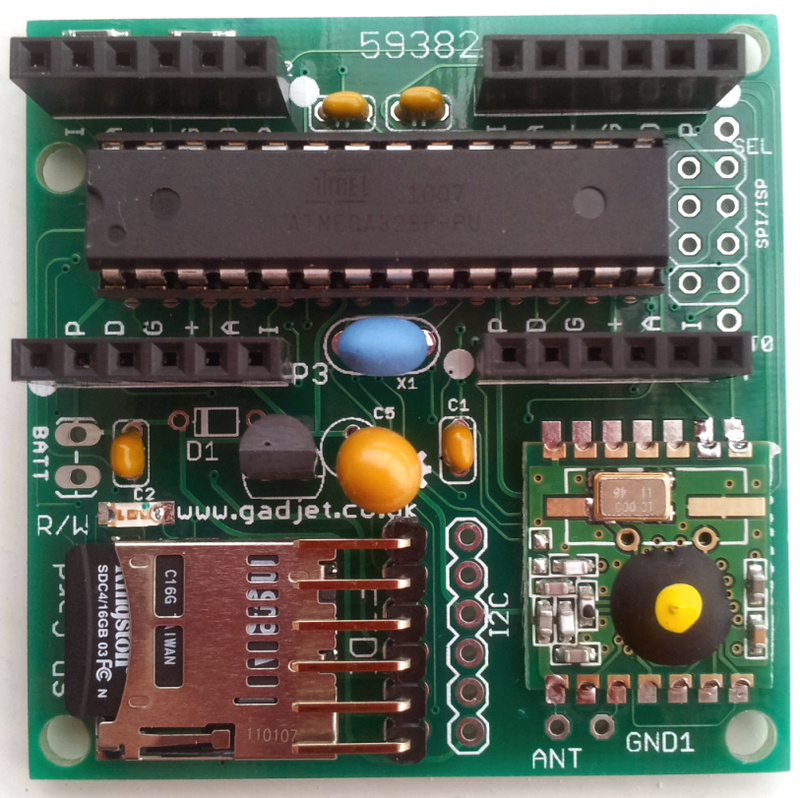 The Processor board for my shields arrived this morning and I've finished assembling the parts and tested the GLCD, RFM12B and the SD Card socket. 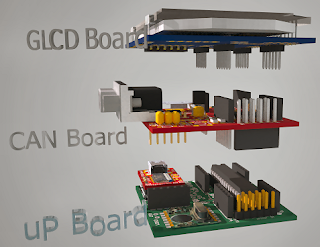 One of the main reasons behind this PCB is so I can have a driver for the Jeelabs GLCD that is physically smaller than the GLCD PCB and will be easier to mount in an enclosure but now all sorts of ideas are now springing forth! 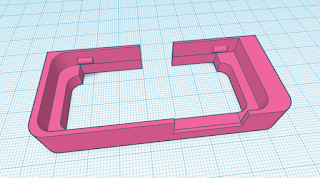 This is the first time I've used a few SMD components, I'm using the 1206 size because I can just about manage them without too much eye strain. So far I've tested the GLCD, RFM12B and SD card reader and all seems OK so far. 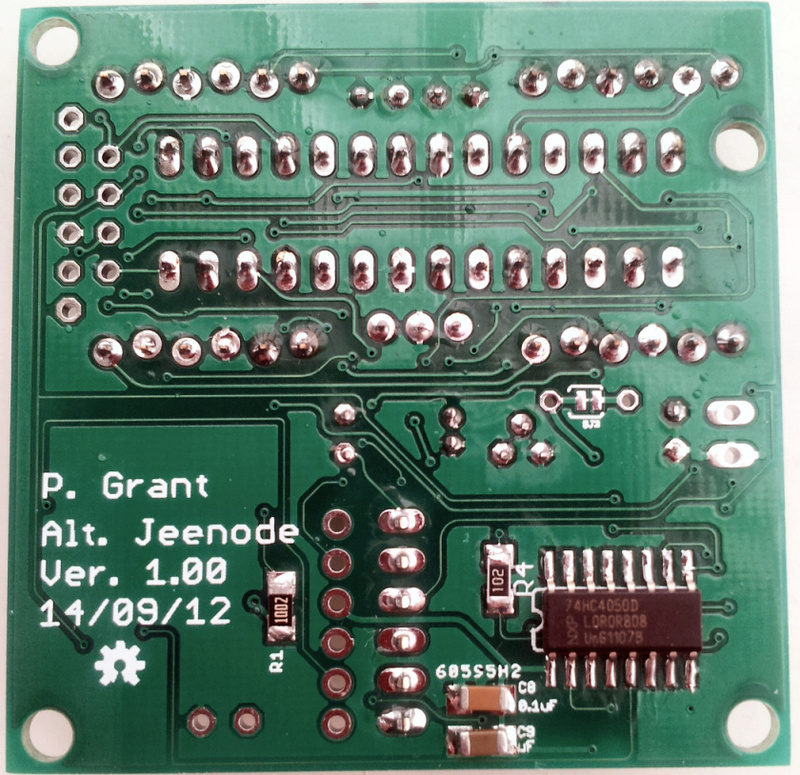 Eagle Files for PCB are here. Screen grab of SD card info sketch. So far so good, all going to plan. Having spent a while playing with the some of the different options available in the world Arduino open hardware and software and discovering a very reasonably priced source of PCB manufacture I've spent more time designing the hardware than I have the software side of things, I have a few plans for final applications but keep getting side tracked by new ideas of what to do with the hardware. 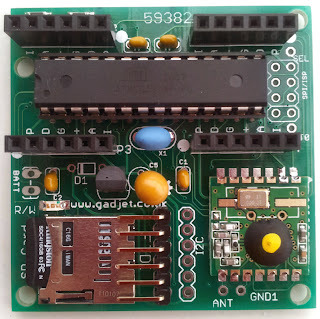 Anyway my latest idea was to create my own PCB to plug on the back of the GLCD hardware from Jeelabs, one that was a similar size and shape to the GLCD. 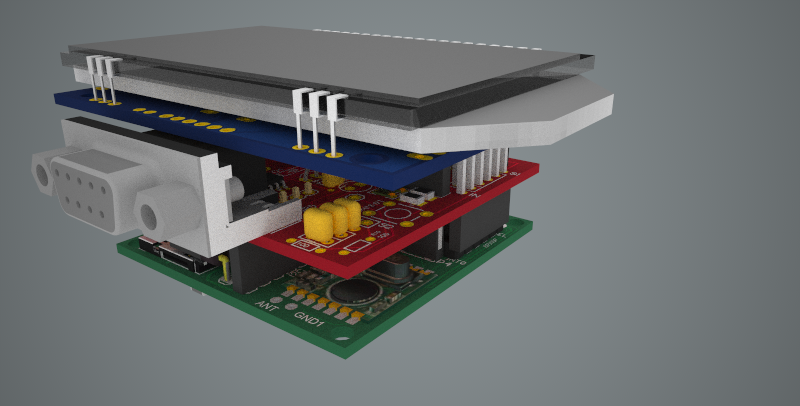 Whilst doing that I was also thinking about producing a CAN interface PCB for the new layout that could be sandwiched between the processor PCB and the GLCD PCB and I wanted a method to allow me to validate the PCBs within a 3D environment. 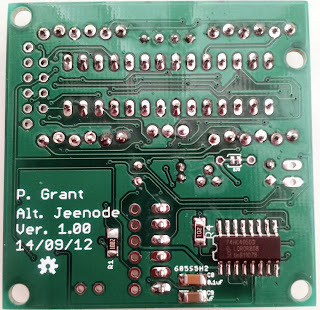 After a quick Google I found that there were scripts written which would allow the PCB in Ealge (Circuit layout and PCB design software) to be exported in a format that would allow Google SketchUp (Free 3D design software) to import the PCB with holes, vias, silk text and tracks, this made it a lot easier to visualise the PCBs and hopefully spot any errors prior to ordering the PCBs. Within Google SketchUp there is access to the 3D Warehouse where people generate models for all sorts of things and make them available for other people to use and there are quite a few electronic components in there, including Arduino boards. 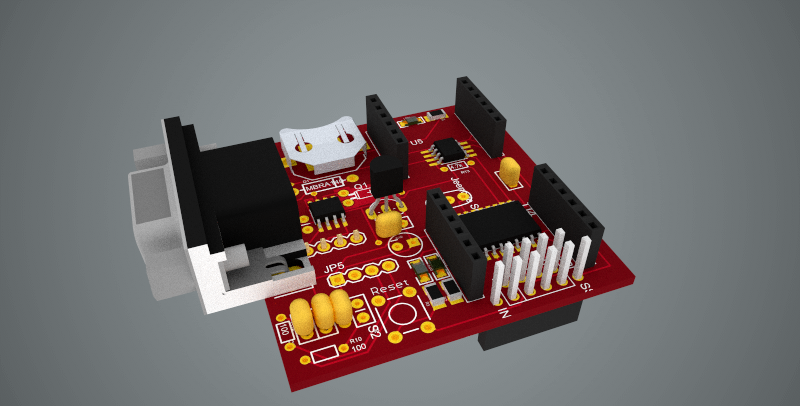 I also had to model a few parts myself, like the Jeelabs GLCD and PCB assembly, Sparkfun's Basic FDTI board. If you want to use the models just search for GLCD in the 3D warehouse and you should find them. 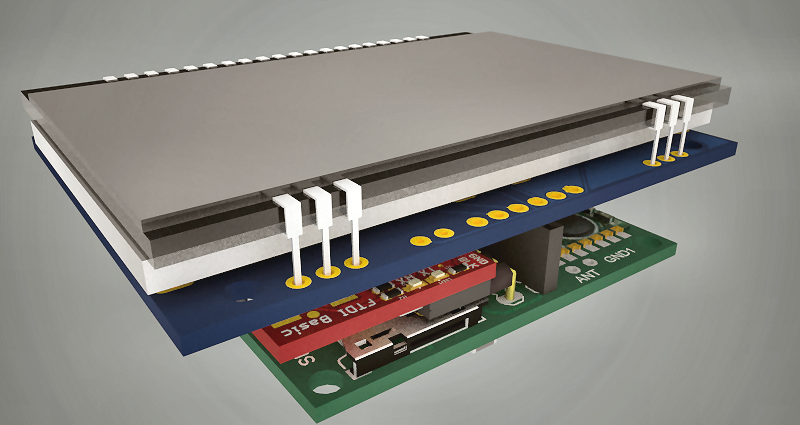 If the Eagle export setup is configured correctly and the models are available in the correct folder the export will also include the components on the PCB as well. The the setup tutorial and link to the software download can be found here. Here are some of the exports I made from Eagle, these have also been rendered by a SketchUp plugin called Maxwell.